And now the ‘ring quest’ is complete. For many others who have also completed this set…it’s a goal poor Larfleeze–“Agent Orange”–will likely never get to do. As I’ve said before, I think this is just about the coolest promotion for comics I’ve seen. Of all the rings, of COURSE the coolest wound up being the Green Lantern ring. Because when you come right down to it–whether that first year or so following Kyle’s book, or that brief period after reading the Amalgam “Iron Lantern” issue when I was all the more interested in GL, to more recent years–it’s the “original” of the Corps. Another thing that I wonder about is what other similar promotions could be done? Including the year it came out (1991), next year (2010) will be 20 years OF The Infinity Gauntlet; 2011 obviously being the 20th “anniversary.” How cool would it be to have something like this ring promotion for a re-issue of the original mini-series (6 gems, 6 issues…nice, no?). 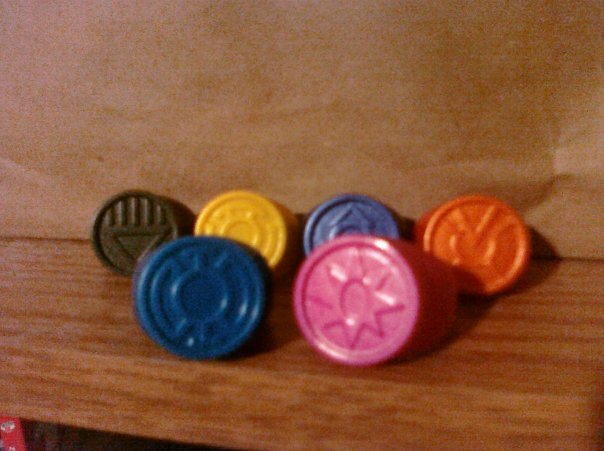 Or sticking with DC: what about a Legion of Super-Heroes ring? 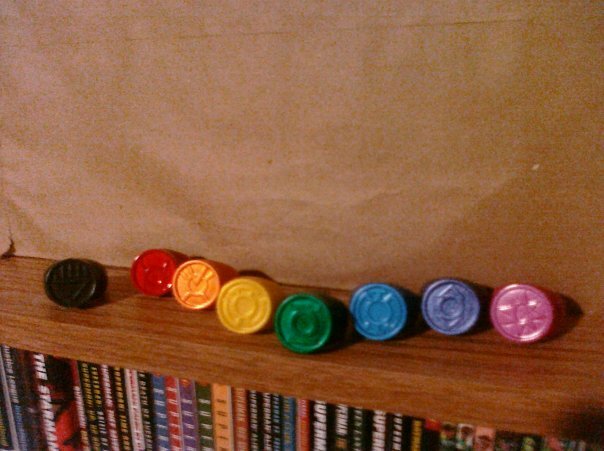 As with all these Lantern Corps rings…just change the color of plastic used and the little symbol on the top piece. Such a ring could be tied to a special Legion issue or annual or issue of Adventure Comics or the like. And what about a Flash ring? Given Barry’s back, and I believe the Flash-costume-in-a-ring-for-easy-access was his thing…so why not use the red plastic again and put the lightning bolt on the top piece? And tie this, say, to the new Flash #1 by Johns. Another week, two more rings. This week’s rings were the blue and violet (or Star Sapphire). 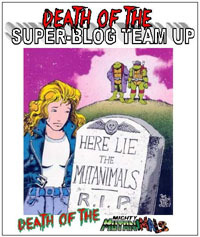 They came with Adventure Comics and Outsiders. Amusingly enough, if you put ’em together, they look more blue and pink, almost as if they are something for kids. With these rings, we’re left only missing the Green and Red rings…those are due next week, I believe. Now, this is getting to be more like it! Including that Black Ring from Blackest Night #1, 4 out of the 8 rings are now available. I’m very thankful that my comic shop, at least, is giving the rings away with purchase of the comics that had to be ordered in X quantity to be able to order the rings. I have not yet asked the comic shop if (any of) the rings are going to be for sale individually–I think the temptation to try to purchase an extra or two might be a bit too great. Of course, when you get right down to it, the ones I’d most be interested in getting multiples of would be the Green and Yellow. But as-is…cool as these are, I think they’d lose just a little bit of specialness if they weren’t unique items in my collection.